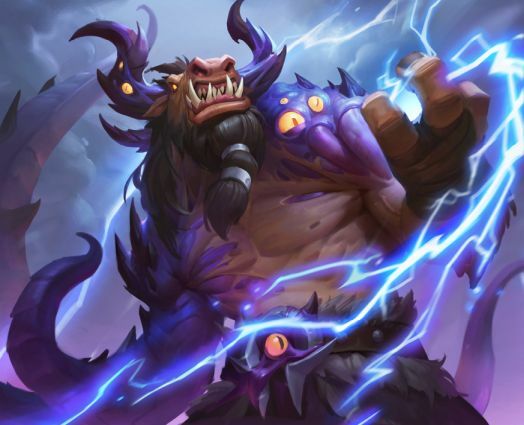 Blizzard has clarified a number of things about Echo cards on Reddit and Twitter since the mechanic was revealed. The Echo copies will not retain any discounts or buffs the original card had. The Echo copies can be discarded from hand with the Discard mechanic. If you play Dead Man’s Hand while holding an Echo copy of a card, Dead Man’s Hand will shuffle a real version of the card into your deck. 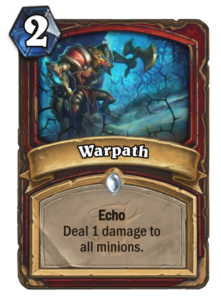 Warpath is a two-mana Warrior spell with Echo that deals 1 damage to all minions. Excellent to combo with Acolyte of Pain, it can deal up to 5 damage to all minions with 10 mana. 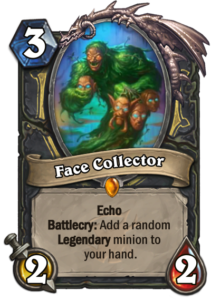 Face Collector is a three-mana 2/2 Rogue minion with Echo that has a Battlecry to add a random Legendary minion to your hand. As Rogue has many ways to bounce minions, you can add many random Legendary cards to your hand. 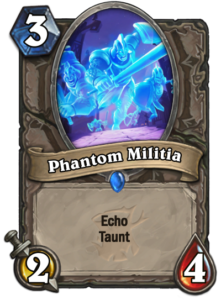 Phantom Militia is a three-mana 2/4 Neutral minion with Echo and Taunt. 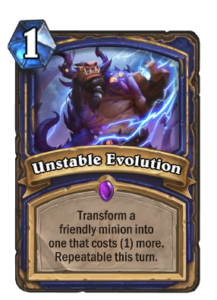 Unstable Evolution, although from Kobolds and Catacombs, is an Echo card in all but name. It is a one-mana Shaman spell twith Echo that transforms a friendly minion into a random minion that costs (1) more. Various combinations of these can provide some extremely interesting results, the infinite Unstable Evolutions with an Evolved Radiant Elemental or Sorcerer’s Apprentice being a taste of things to come. Twig of the World Tree (Druid): Deathrattle: Gain 10 Mana Crystals. Corpse Widow (Hunter): Your Deathrattle cards cost (2) less. Sorcerer’s Apprentice (Mage): Your spells cost (1) less. 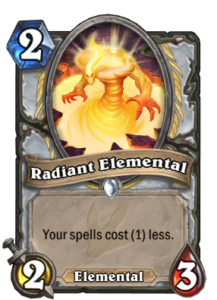 Radiant Elemental (Priest): Your spells cost (1) less. Summoning Portal (Warlock): Your minions cost (2) less, but not less than (1). Aviana (Druid): Your minions cost (1). Youthful Brewmaster (Neutral): Battlecry: Return a friendly minion from the battlefield to your hand. Ysera – Dream (Neutral): Return a minion to its owner’s hand. 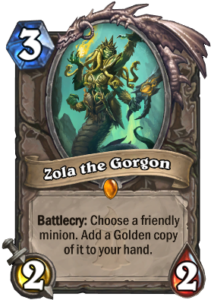 Zola the Gorgon (Neutral): Battlecry: Choose a friendly minion. Add a Golden copy of it to your hand. Simulacrum (Mage) Copy the lowest Cost minion in your hand. Shadowstep (Rogue): Return a friendly minion to your hand. It costs (2) less. Sonya Shadowdancer (Rogue): After a friendly minion dies, add a 1/1 copy of it to your hand. It costs (1). Vanish (Rogue): Return all minions to their owner’s hand. Spirit Echo (Shaman): Give your minions Deathrattle: Return this to your hand. Dead Man’s Hand (Warrior): Shuffle a copy of your hand into your deck. Echo of Medivh (Mage): Put a copy of each friendly minion into your hand – return Echo card to your hand. Duplicate (Mage): When a friendly minion dies, put 2 copies of it into your hand. Getaway Kodo (Paladin): Secret: When a friendly minion dies, return it to your hand. Gadgetzan Ferryman (Rogue): Combo: Return a friendly minion to your hand. Gang Up (Rogue): Choose a minion. Shuffle 3 copies of it into your deck. Shadowcaster (Rogue): Battlecry: Choose a friendly minion. Add a 1/1 copy to your hand that costs (1). Blood Warriors (Warrior): Add a copy of each damaged friendly minion to your hand. The Voraxx (Neutral): After you cast a spell on this minion, summon a 1/1 Plant and cast another copy on it. Dragon Soul (Priest): After you cast 3 spells in a turn, summon a 5/5 Dragon. Sherazin, Corpse Flower (Rogue): Deathrattle: Go dormant. Play 4 cards in a turn to revive this minion. 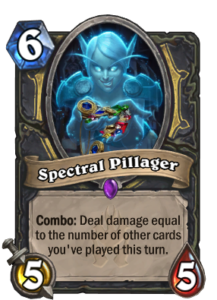 Spectral Pillager (Rogue): Deal damage equal to the number of other cards you’ve played this turn. Djinni of Zephyrs (Neutral): After you cast a spell on another friendly minion, cast a copy on this one. Echoing Ooze (Neutral): Battlecry: Summon an exact copy of this minion at the end of the turn. Lock and Load (Hunter): Each time you cast a spell this turn, add a random Hunter card to your hand. It will be interesting to see what synergies will be discovered when The Witchwood is released!